Much like Colombia’s win over Ivory Coast, this was a tactically simplistic game decided by who possessed greater quality. Unlike Colombia’s win over Ivory Coast, it was not close. 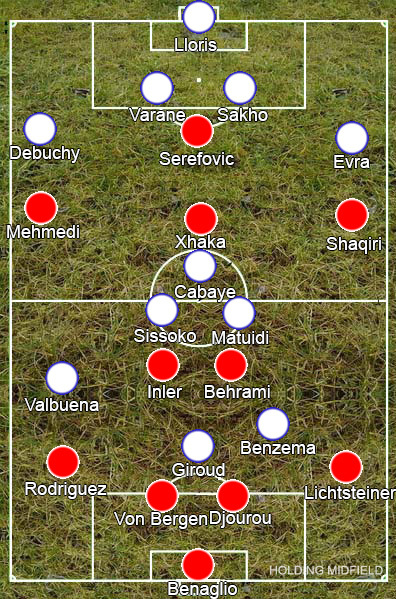 The two teams played mirrored formations: Switzerland in a 4-2-3-1, bringing in Admir Mehmedi and Haris Serefovic for Valentin Stocker and Josip Drmic from the team that beat Ecuador, and France in a 4-3-3, switching Antoine Griezmann and Paul Pogba of the Honduras game for Olivier Giroud and Moussa Sissoko. Karim Benzema’s positioning on the left provided the only tactical intrigue for the match. Rather than follow Stephan Lichtsteiner when he ventured up the pitch, Benzema stayed in attack, making him a constant threat on the counter, but also allowing him to push up against the centre-backs with Olivier Giroud, ensuring they didn’t have anyone to bail them out. Giroud put the French ahead from a corner and Blaise Matuidi double there lead barely after the replays had finished, pouncing on a poor Valon Behrami pass. From there, they sailed past Switzerland. A missed penalty came from a Benzema counter and they were caught out in this area behind Lichsteiner again for the third, Giroud squaring it to Matheiu Valbuena. By the time the fourth and fifth rolled in Swiss heads had dropped and the French were just having fun. They at least gave away two goals late in the game to give them something to work on in training, but really they were just lazy consolations. Switzerland should still make it out of a poor group but don’t look like coming close to fulfilling that dark horses tag many slapped on them before the tournament.